Join us at the PRETTIEST RACE IN TEXAS on November 23, 2019! The Chosen Half Marathon and 5K is set in the heart of central Texas Hill Country in between Austin and San Antonio. Enjoy rolling hills and stately trees as you run along the gorgeous Guadalupe River. Kids (11 and under) can join in the fun at the Chosen Kids Fun Run (1/8 or 1/4 mile). Runners can participate from anywhere in the world by running the Chosen Virtual Half Marathon. Run alongside the beautiful Guadalupe River in this point to point Half Marathon. Runners will take a 30 minute bus ride to the start line or can choose to be dropped off at the start. Enjoy this 5K course that starts and ends along the gorgeous Guadalupe River in historic Gruene. Virtual Runners will run a half marathon (13.1 miles) anywhere in the world between November 1 and November 23, 2019. . Please note a $25 shipping and handling fee will added at checkout. The Chosen Kids Fun Run is a 1/8 mile loop on the finish line grounds. Ages 3-11. Do you want to support Chosen but are not a runner? Sleep in, but still join us in strengthening foster, kinship and adoptive families and helping children heal from trauma. Half Marathon start time is 7:30am. Please note that the start is a 30 minute drive from Rockin R in Gruene. Half Marathoners will be bused from Rockin' R in Gruene to the start line at The Summit (approx a 30 minute ride). The bused runners will begin boarding buses at 6:00am with the last bus leaving at 6:45am. Buses will leave for the start as they are filled. Runners can choose to make their own transportation arrangements for drop off at the Rio Guadalupe Resort (14130 River Rd, New Braunfels, TX 78132). The Rio Guadalupe dropped- off runners will take a short 1-mile shuttle ride to The Summit. THERE IS NO DROP OFF AT THE SUMMIT and NO PARKING at either The Summit or Rio Guadalupe. Runners must be at least 12 years old to run the half marathon. Runners will receive a personalized race bib, the official 2019 Chosen Half Marathon technical shirt, and the official 2019 Chosen Half Marathon finisher medal as well as tacos and beer at the finish. Please note due to insurance restrictions, no dogs are allowed on the course. Please visit www.chosen.care/race/ for more information. 5K Runners will start and finish at Rockin R in Gruene. Runners must be at least 5 years old and runners between the ages of 5 and 11 must run with an adult. Runners will receive a personalized race bib, and the official 2019 Chosen 5K T-shirt as well as tacos and beer at the finish. Please note due to insuranc restrictions, no dogs are allowed on the course. Do you want to run the Chosen Half Marathon, but are not able to run with us on November 23rd? 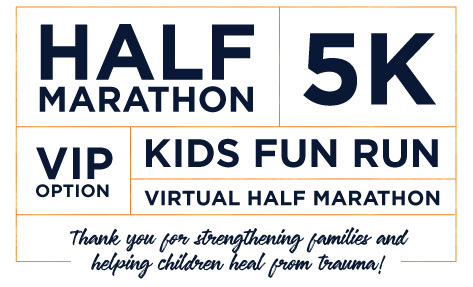 You can still run with us, VIRTUALLY! Virtual Runners will run a half marathon (13.1 miles) anywhere in the world between November 1 and November 23, 2019. After you email us a photo of your results to results@chosen.care (a photo of your GPS watch/FitBit/app readout) you will receive a personalized race bib, the official 2019 Chosen Half Marathon finisher medal and the official 2019 Chosen Half Marathon technical shirt. When logging miles, they must be captured at one time (consecutively) as if you were running/walking the event on race day. Please note a $25 shipping and handling fee will added at checkout. The Kids Fun Run is a 1/8 mile run for ages 2-8 and a 1/4 mile run for 9-11 year olds. This run is held on the Rockin R Property in the Finish Line area. Registered kids will receive an official 2019 Kids Fun Run T-shirt. Half marathon and 5K runners will have access to a private, relaxed atmosphere with food and beverages, post-race massage and an exclusive VIP give away. Purchase of the VIP Package includes onsite parking and a separate "no line" bag drop. Packets will be available at your choice of location: Austin (Wed, 11/20) / San Antonio (Thurs. 11/21)/ New Braunfels (Fri. 11/22). Please note all packets are delivered to each location on the day specified. For example: If you can't make packet pickup in Austin on the date, then you are able to go to SA or NB to pick up your packet. There is NO Half Marathon packet pick up on race day, but 5K runners can pick up their packets on race day. Mailer Packet Option ($25): If you are unable to pick up your packet at an above location, you can choose the mailer packet option. For $25, your packet will be mailed to you the week of the race. Please make sure you add this option to your registration at check out. All mailer options must be selected by November 1st. Registration will remain open online until Thursday 11/21. Please note the days and locations of packet pick up if registering during race week. There is no packet for Kids Fun Run. Kids will check in at the Kids Fun Run registration tent the morning of the race between 9:00 and 9:45. Chosen Registrations are non-refundable and non-transferable due to administrative constraints and liability. Any inquiry regarding this policy will be directed back to this page. Transfers between one participant to another are prohibited. Transfers to a new subevent for the registered indivdual are allowed but will be subject to the difference in registration prices and a small transfer fee. Refunds will not be given for transferring to a shorter distance.